This bright little visitor from the south was seen more often in former years than today. The decline in sightings is something of a mystery. 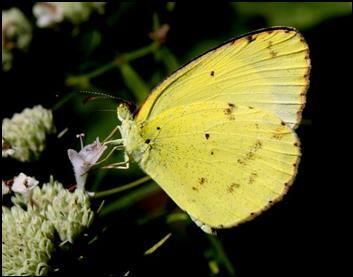 Scudder called this the Little Sulphur, writing that it could be found in abundance in the extreme south of New England, “where it may be met with along the entire shore of Long Island, Rhode Island, and Cape Cod and on the outlying islands (1899: 1091).” Today it is only a rare or occasional vagrant in Rhode Island, Connecticut and Massachusetts. It has not yet been shown to successfully over-winter in any of these states. Pelham (2008) places lisa in the genus Pyrisitia. Early New England lepidopterists reported Little Yellow quite frequently. By the late 19th century it was known from Cape Cod, Nantucket (where it was “tolerably common”), and the vicinity of Boston (several collectors), as well as from the Connecticut River valley locations of Sunderland, Springfield, South Hadley, Holyoke, Granby, and Montague (Scudder 1889: 1091). Noted collector F. H. Sprague reported a specimen from Granby taken on August 22, 1878 (Sprague 1879). In the Harvard Museum of Comparative Zoology today are three specimens from South Hadley dated August 8, 1883, six from Holyoke dated August 9, 1883, and 15 from Granby dated August 31, 1885, all in the F. H. Sprague collection. There is an 1896 specimen from Wellesley in the MCZ Denton mount collection.. The town of Sharon, Massachusetts, was also apparently a good location at the turn of the century. At a 1907 meeting of the Cambridge Entomological Club Mr. A. C. Sampson remarked that he had taken several specimens of Little Yellow there in one season (Psyche XIV, No. 3: 63). There is an August 12, 1912 specimen from Manapoag Pond in Sharon in the Harvard MCZ, taken by W. Faxon. By 1934 Farquhar’s review of New England lepidoptera turned up many more Massachusetts locations where Little Yellow had been found. In addition to Scudder’s reports, Farquhar lists specimens from Fall River (July, September, and October; W. P. Rogers), Wood’s Hole (W. T. M. Forbes), Norwood and Sharon south of Boston; Stoneham, Manchester, Ipswich, Essex, Marblehead, Gloucester and Salem north of Boston; and Malden and Framingham to the west. At Woods Hole on the Cape, Forbes later reported (1960: 115) that Little Yellow was "evidently breeding" there where he had captured it. From the north shore, many of the reports are by Austin H. Clark, who with his son captured four Little Yellows in Manchester, two in Essex, and one in Ipswich between July and September 1924 (Clark 1925). From the 1940’s and 1950’s there is at least one important mainland report: Vladimir Nabokov wrote that during "the warm autumn of 1946...the Little Sulphur (was) abundant throughout the fall along the railway line near Wellesley..." (quoted in MAS Atlas 1990). More probably the year was 1945, since twelve Nabokov specimens from Wellesley, dated August 1945, are in the MCZ. On the islands, Frank Morton Jones called Little Yellow "well distributed, sometimes far from rare" on Martha's Vineyard in the 1930's and 1940's. His earliest date was June 26 (Jones and Kimball 1943). Two of his specimens (both undated, but one from 8/18) reside today in the Yale Peabody Museum. And on Nantucket, Charles Kimball called the Little Yellow "an infrequent visitor," and there are pre-1943 specimens in the Maria Mitchell Museum on Nantucket (LoPresti 2011). But through the 1960’s, 1970’s and 1980’s there were reports in only a few years, and the number of locations is not as numerous as in preceding years. Although for southeastern New York Shapiro (1974) reported that Little Yellow arrived from the south and bred “almost every year,” this was not the case in Massachusetts so far as we know. Little Yellows were reported here in only three years--1968, 1973 and 1979. In 1968 there was an especially large migration into New York and Connecticut, which was marked in Massachusetts by only a single sighting: James P. Holmes’ report of a Little Yellow on July 26, 1968 in Rockport (LepSocSeasSum 1968). A rash of reports came in 1973: Patrick Carey, a collector in Holyoke, found three specimens of Eurema lisa at the Fannie Stebbins Refuge in Longmeadow in late September, and at the other end of the state, one Little Yellow was seen at Marblehead in Essex County on August 7 by R. Robbins (LepSocSeasSum 1973). That same year, William D. Winter found an “extensive colony” (24+) at Medfield Junction breeding on Cassia nictitans, which was growing along railroad tracks. He observed the colony in August and September (WDW Field Season Records 1973). Several specimens from this colony are now in the Harvard MCZ. The colony apparently did not over-winter, since there are no reports in subsequent years, but eleven years later, in 1984, a single Little Yellow did turn up again in Medfield (LSSS 1984). Finally, for 1979, there is a specimen in the Yale Peabody Museum taken at Falmouth Woods Hole (7/28/1979, L. F. Gall), so the butterfly apparently did return to that area where it was first reported some fifty years earlier by Forbes. During the 1986-90 MAS Atlas years, only two sightings of Eurema lisa were reported: September 3, 1990, South Hadley (1), T. Fowler; and September 17, 1991, North Monomoy (1), B. Cassie. MBC records begin with the North Monomoy report, and add the sighting of 2 Little Yellows on October 8, 1993, at Aquinnah Gay Head by R. Forster. There are many MBC records of the large 1999 incursion, after which there were no reports until the colony found at Mattapoisett in August 2012, thirteen years later (see Chart 114 below). The host plant reported from the earliest observations in Massachusetts was Cassia [=Chamaecrista] nictitans, or wild sensitive-plant. This is the plant reported for the historic Holyoke colony in the 1880’s, for the Medfield colony in 1973, and for the 1999 Holyoke colony reported by Roger Pease and other MBC members. Wild sensitive-plant grows in dry areas, such as along railroad tracks. However at the Mattapoisett colony found in August 2012, the host plant was Cassia [=Chamaecrista] fasciculata, or partridge pea. Photos of Little Yellow eggs on this plant, and of the plant itself, were taken at this site by Elise Barry and by Garry Kessler (http://garrykessler.zenfolio.com/p657953197). No C. nictitans was observed at this site. During the large 1999 incursion into New England, Connecticut Atlas workers reported numbers of adults in Branford and Guilford in September ovipositing on both C. nictitans and C. fasciculata, or partridge pea. Atlas workers raised Little Yellow on partridge pea. These two plants are the most widely listed Little Yellow hosts (Scott 1986; Shapiro 1974; Opler and Krizek 1984). Both are native to and reported from nearly all counties in Massachusetts (Sorrie and Somers 1999; Magee and Ahles 1999), but how common they are is not known. Partridge pea is widely used in commercial meadow mixes, and may therefore be becoming more common. Little Yellows are also reported to lay eggs on Cassia marilandica and Cassia hebecarpa (Scott 1986), and they have been found in Rhode Island in probable association with these plants. All Little Yellow hosts are native legumes. Little Yellow’s habitat is dry fields, sandy waste areas, roadsides, railroad beds, wood edges and other open habitats where its preferred larval food plants and nectaring sources occur in abundance. Eurema lisa is known for its wide-ranging migrations northward, but it is still uncertain exactly at what latitude it can survive the winter. There have been suggestions of over-wintering in New York City area, in coastal Connecticut, and in Rhode Island, but there is no strong evidence yet. Little Yellow is also known for an uncanny ability to return to the same small sites year after year. Cech and Tudor (2005) cite the nearly yearly return to a certain quarter-acre patch of sandy scrub on a New York City beach; it also returned to the Holyoke, Massachusetts site for many years. Little Yellow is an infrequent colonizer which is not known to overwinter in Massachusetts. In both Atlas (1986-90) and MBC (2000-2007) records, Little Yellow ranks as Rare or Very Rare (Table 5). Both these sources may underestimate the abundance of Little Yellows, as they may have been overlooked or misidentified. In 23 years of BOM and MBC records (1991-2013), there are single reports of Little Yellow in 1991, 1993, and 2003, and two "invasion" years, 1999 and 2012. The first year locally known as the Great Invasion was 1999 (Benner 2010). That year the earliest sighting was on July 8, from Oak Bluffs on Martha’s Vineyard, M. Pelikan, followed by reports of singles from Falmouth, Truro, and Dartmouth. Then on August 7, 1999 a colony of 4-5 males and 1-2 females was found by R. Pease in a field in Holyoke, Massachusetts. The colony was visited by several observers from then until October 11, 1999, and two broods were noted. The high count was nine, in July, so this was not a large colony. But there were also sightings of singles in nearby towns of Northampton, Sunderland and Whately. On the southern coast at Westport, three were discovered on September 25, 1999 by R. Hildreth. On October 11, four were still present in the Holyoke field, and one seen in Sunderland. The year 2012 proved to be another invasion year in the state. First, a sizeable colony was discovered August 2, 2012, at Nasketucket Bay State Reservation at Mattapoisett, on the southeastern coast, by Gail Howe Trenholm. Several observers documented this colony (see photo above); the highest number reported was 36. The host plant partridge pea was reported present in ample amounts (Dysart photo at http://bit.ly/Pn9xtZ). Then in September, Little Yellows were discovered in two places in western Massachusetts: along a rail trail in Westfield/Southwick by F. Model, and in Sunderland by M. Fairbrother. The high count at the Sunderland site was 8, by R. and S. Cloutier. At least three were seen in October in coastal south Dartmouth, and there was a photographed sighting on Martha's Vineyard. But in the next year, 2013, no Little Yellows were seen. Little Yellows were present in Rhode Island in 2010, 2011, and especially 2012 (e.g. 9/15/2012, 2 at Westerly Avondale Preserve, and 8/25/2012, 30 at Charlestown Ninigret Park, M. Arey ). 2010 was a particularly good year for Little Yellows in Rhode Island and Connecticut: there were fall reports of several colonies along the south coast of Rhode Island (M. Arey, masslep, 9/4/2010, 9/6/2010, 9/25/2010), and from southern Connecticut, but surprisingly there were no reports from Massachusetts that year. In Connecticut, Little Yellow is frequently reported, and in good numbers, but is still only an occasional immigrant, not seen every year. The 1995-99 Connecticut Atlas found only 17 project specimens compared to 81 pre-project specimens (O’Donnell et al., 2007). These numbers suggest that in that state too, the species was more common historically than today, although that may change with climate warming. Little Yellows have been found almost solely in coastal eastern Massachusetts or in the Connecticut River valley. This is the case historically and today; the only known Worcester County report is from Framingham in the 1930's. The species has not been reported from Berkshire or Franklin counties, even historically. MBC and BOM records for the 23 years 1991-2013 (Map 114) show that in eastern Massachusetts Little Yellow was reported most often from the south coastal area (Mattapoisett, Dartmouth), but also several times from Cape Cod (Falmouth, Truro, Monomoy). These are thus quite likely areas for Little Yellow. Little Yellow was not been observed in this time period in the greater Boston area, or north of Boston in Essex County, despite the many historical reports. In the central part of the state, singles of Little Yellow were reported on 10/6/2012 (the invasion year), and on 8/9/2014 (with photograph), in Ware (Hampshire Co.), by B. Klassanos. The site was the Klassanos farm, where a good amount of partridge pea was reported growing. Ware is shown on Map 114. From Martha's Vineyard, Little Yellow was reported three times in this 23-year time period: Oak Bluffs in 1999, Aquinnah in 1993, and October 15, 2012, when Pam Weatherbee photographed it at Chappaquiddick in Edgartown. The Vineyard checklist ranks it as "rare" (Pelikan 2002); all three locations were right at the coast, suggesting recent arrival. For Nantucket, there were no reported records in this period. But in light of the historical records, both Martha's Vineyard and Nantucket are likely spots where Little Yellows might appear and find the requisite habitat and host plant. The largest concentration in the 1991-2013 time period was the 2012 colony in Mattapoisett, where the high count was 36 (8/2/2012, G. Trenholm). The next highest was the 9 reported from the town of Holyoke in 1999. In recent years, Little Yellow has never arrived in Massachusetts prior to July, as far as is known. The earliest known record (including all museum specimens) is that quoted by Scudder of June 12, 18? ?, from Mattapan in Boston, and the next earliest is Jones' June 26 report for Martha's Vineyard in the 1940's. The earliest observation in MBC records is July 8, 1999 Oak Bluffs, M. Pelikan. The flight period, as derived from MBC records, is July through October, with the most sightings being reported in August and September: see http://www.naba.org/chapters/nabambc/flight-dates-chart.asp . The latest date in MBC records is October 22, 2012, Mattapoisett, J. Dwelly. The previous late date had been October 11, 1999, Holyoke, R. Pease and Sunderland, D. Case. The latest known date is that quoted in the MAS Atlas: October 30, 1921, Fall River, W. P. Rogers. Scudder did not know of any October captures, so there may have been some extension of the flight time since 1900, since hard killing frosts are now arriving later than a century ago. A report of a fresh male Little Yellow at Ninigret Park in Charlestown Rhode Island on May 14, 2011 again raised the suspicion that this species may have successfully over-wintered in that vicinity (M. Arey, H. Pavulaan, masslep 5/15/2011). If this is true, Little Yellows may start to appear earlier in Massachusetts. Little Yellow is a mobile, widespread and adaptable species, with multiple broods throughout the year in the southeastern states, southern Texas, and Central America (Cech and Tudor 2005). As climate warms in the northeastern states, an increase in the frequency and number of temporary colonies here, and more over-wintering success, may be possible if there is suitable habitat (Table 6). The 2012 incursion reminds us that Little Yellow is always a possibility in Massachusetts, and that we will probably be seeing more of this lovely small species in the future.